July 4th is a preposterous time for starting a garden in this area (where by mid-September, sometimes sooner, we’re sure to have received at least one killing frost). But we didn’t manage it earlier, and being the American “Independence Day” it seemed, at least symbolically, a fitting one… so that was when we did it. 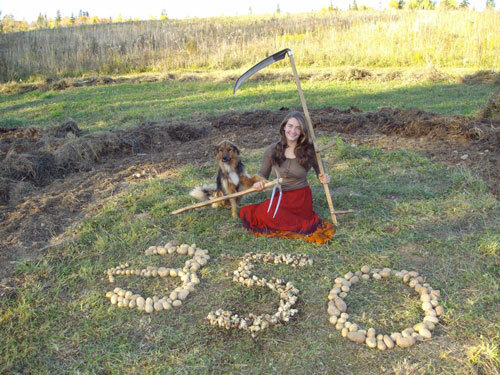 We were already planning to do this pioneer/emergency style of gardening experiment; and in support of the 350.org climate-related action, incorporating the 350 logo was only natural. What is so pioneer-like about this approach? For one thing, the pioneers were — by necessity of the times — utter conservationists, at least initially. That is to say, they had to use available energy very carefully. (Those who failed to do so often died…) For another, they did not always expect that the living conditions in “the new promised land” would be as harsh. So often they actually were put to more of a survival test than in their respective homeland. Well, to manifest the concept of “voluntary contraction” — something that many authors have been writing about recently (although none of them are advocating the use of hand tools to the extent the situation alreadycalls for), we used only two tools to create this garden– the scythe and a hoe, and possibly even the hoe could be dispensed with. We’ll see, because some of the potatoes and Jerusalem artichokes were simply laid on top of the freshly mown meadow and covered with the cut grass. 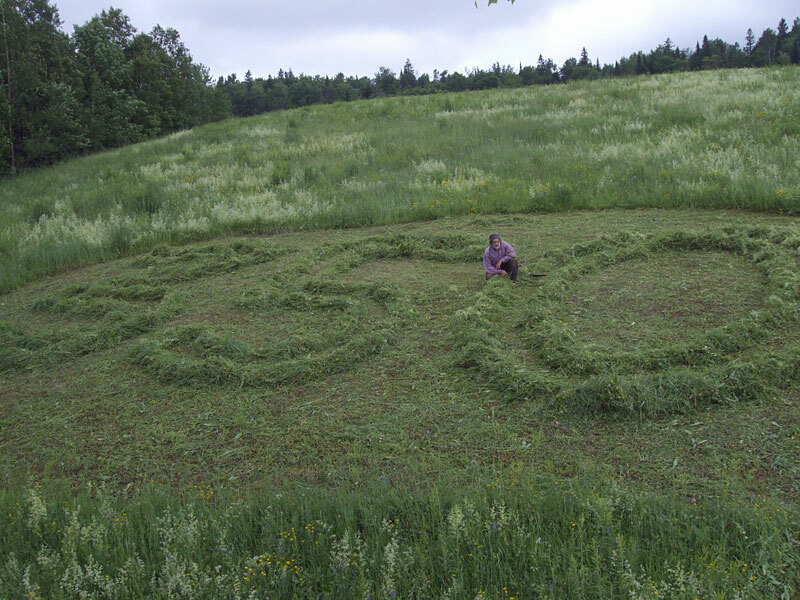 We mowed the area and, using the scythe instead of a hay fork, gathered the cut forage into the shape of 350. Using a sturdy Italian pointed hoe (this soil is full of rocks) we removed small chunks of sod (each 14-16″ along the line of the design) and left them laying simply inverted beside the shallow “holes”. We placed the tubers into the holes and pushed the cut grass very close to them (though not yet quite over the top). All in all this is less than three person/hours of activity — which we consider fun rather than “work”. Of course, in order to procure adequate mulching material to keep the sod “subdued”, we’ll need to expand the mown area as the season progresses. We’ll report the success/failure of this project, how much total time it will have taken and how large an area will, in the end, be needed just to grow the mulch. The area surrounding the garden design itself will, of course, be cut again. Blessed with a few days of fair weather in late July and early August, we focused on hay making and fall grain land preparation; in the meantime, the little 350 garden was left to fend for itself. Neglect as such was not the idea to begin with — but it added yet another less than favourable touch to the trial. Most of the artichokes and potatoes did survive and, however slowly, have been growing. 33 days from planting we spent another three person-hours to re-mow the surrounding area, as well as an additional strip of the meadow’s (now rather mature) growth as mulching material. The two scythes were the only tools used at this step — both to cut and then move the freshly cut grass from the windrow next to the planted design (whereupon it was hand-placed more carefully around the stems of the root crops/vegetables. The uninitiated (or even many somewhat experienced) scythe users can’t quite imagine how this tool, so well designed for cutting, can also double as a rake and/or fork — to either spread the windrows evenly for effective drying or gather it together to be put into a cart and/or place as mulch around the trunks of nearby fruit trees, etc. 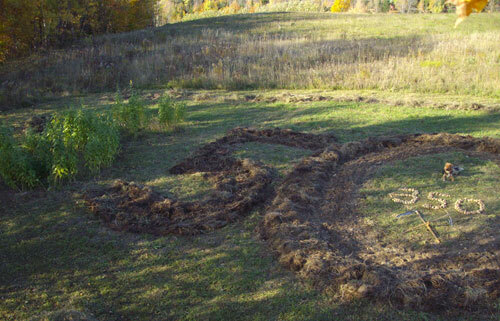 In 2009, in order to further settle our already somewhat established notions about how – given emergencies and/or shortages of resources — food can be grown with a minimum of tools and time input, we started two “pioneer” gardens. One is in a pasture only about 100m from our buildings (thus it received adequate attention) and the other in an old hayfield somewhat out of the way (and thereby sorely neglected). 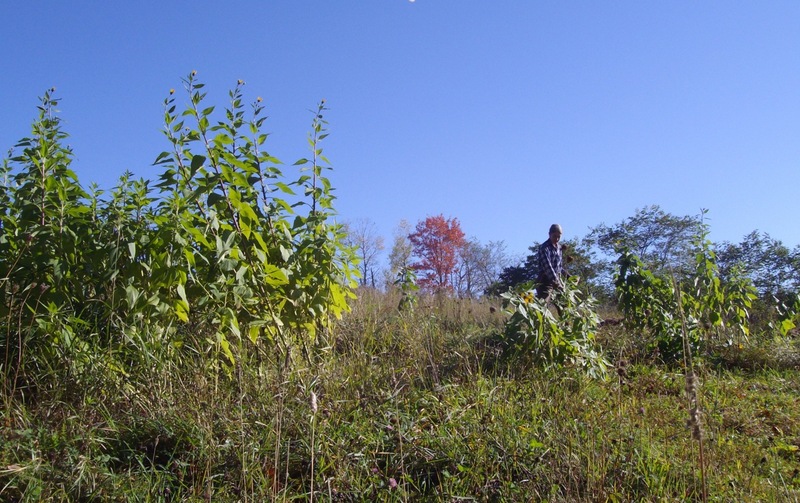 Both were deliberately placed in spots which a “normal” farmer living on this 200 acres of land would NOT pick for a garden. In solidarity with the efforts of Bill McKibben, we chose 350 as the basic design around which one of these gardens would evolve in subsequent seasons. The more intensely cultivated of the plots is briefly profiled in the commentary to the hoe-related videos, the story of the other (the 350 shaped one) is presented below, in both a short and more detailed version. The initial working session took place on May 28; already about a month past an ideal date for the task. The area was first trimmed clean with the scythe. Then, using the scythe blade as a rake (it works very well), we gathered the cut material into strategically placed piles to be subsequently used as mulch over the newly planted tubers. This time the alternate zone (i.e. the area surrounding the 3, 5 and 0, rather than the outline of the numbers themselves) was planted with potatoes and Jerusalem artichokes (also called sunchokes), at more or less 2’/60cm centers. The holes were made by using the Magna Grecia hoe – a significant improvement in effectiveness over the hoe we used for the same job in 2009. One seed piece was placed into each hole, covered with the partially broken up chunks of sod and then loosely mulched with the freshly cut grass. In spite of the seriously dry soil we did not water. We blessed the seed, prayed for rain and left the rest in the hands of the powers greater than ourselves. 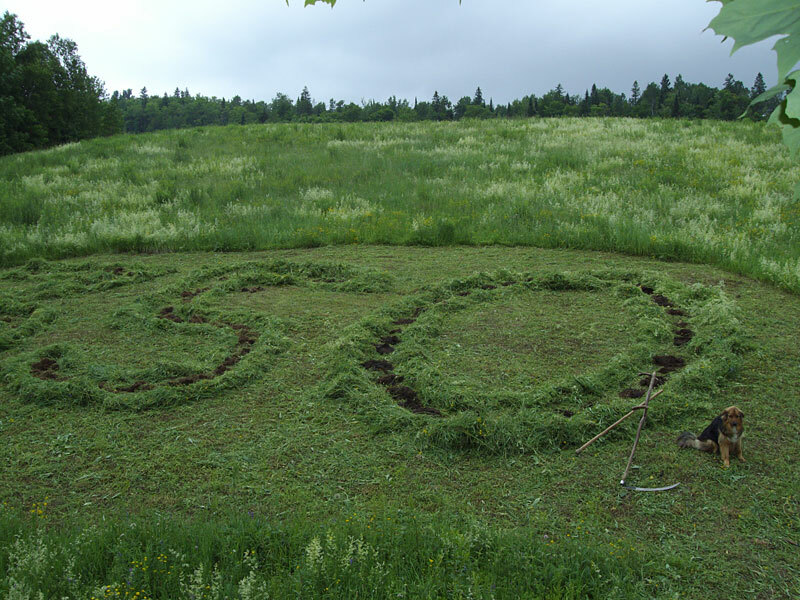 We only returned on October 10 (the day of global 350 action work party) to find a wildly overgrown mere hint of a “garden”. The potato vines were completely withered (several hard frosts had by then taken place) but the sunchokes looked still very alive, some of them blossoming. 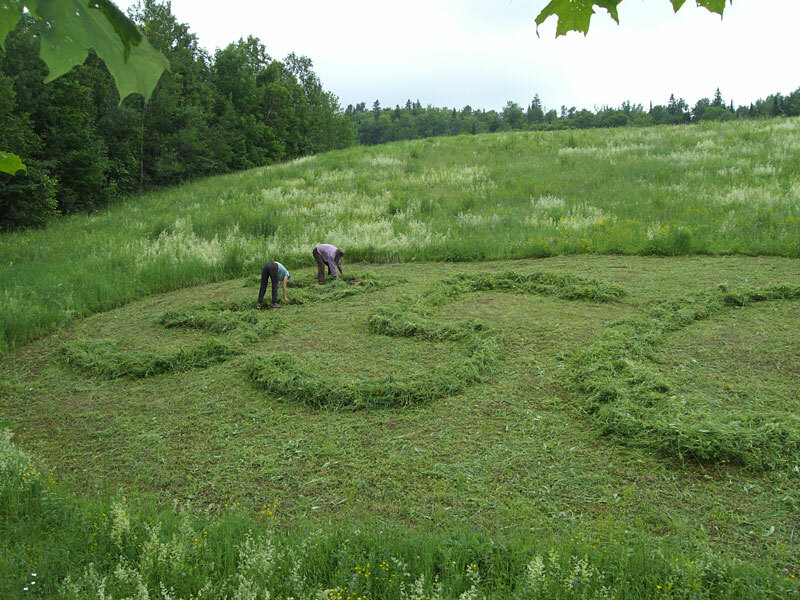 Again – to get oriented and find what was where – the first step was the trimming of the whole area with the scythe. Locating the remnants of mulch which had been placed over the tubers, we proceeded to loosen the soil with the hoe and retrieve the potatoes. The harvest – given the little time spent – was actually surprising. Then we dug up the 0 and planted approximately 2’/60cm wide inner strip of it with garlic and “multiplier” onions – about the only crops which at that time of year could still be planted in this area with any chance of a harvest next year. Taking the 2009 “scythe-made garden” to the next stage – a more detailed report on activity (or lack thereof…) in 2010. Then into this approximately 3’/90cm wide strip we planned to sow small grains – both in a solid stand (requiring no further care until harvest) as well as – for comparison — clean row culture (which would be kept free of weeds by manual means). 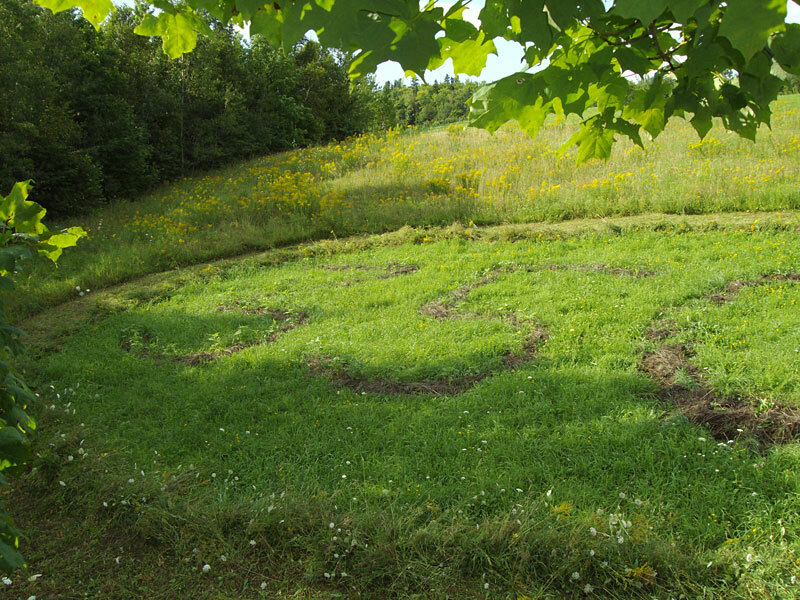 The area within the 0 and surrounding the 3 and 5 was to be planted with potatoes and artichokes and kept under mulch – to be dug up and turned into sod-less culture the following (2011) year. That would have been a project for late April/early May… However, with typically “too many irons in the fire” (and not enough hands to always “hit the iron while it’s hot”) we did not find time to even visit the spot (which is somewhat out of the way of our usual spring activities) until May 28. By then the area appeared “beautifully wild” and showed hardly a trace of previous gardening activity. The sod from under last year’s mulch was making a healthy comeback. (Here the stitch in time that would have saved nine was already missed.) Pondering over the situation, I had a flashback to the scenes from some of the Permaculture homesteads I’ve visited in Europe, and the shots of gardens in Natural Way of Farming – which made me feel better. We joked that Masanobu Fukuoka might actually be pleased, and decided to still go ahead. Before trampling it, we trimmed the whole area with a scythe and gathered the cut grass into piles to be used as mulch immediately after planting. Then, as in 2009, only a simple hole was prepared for each seed tuber. This took from one to three swings with a hoe (depending on how many rocks the blade confronted). 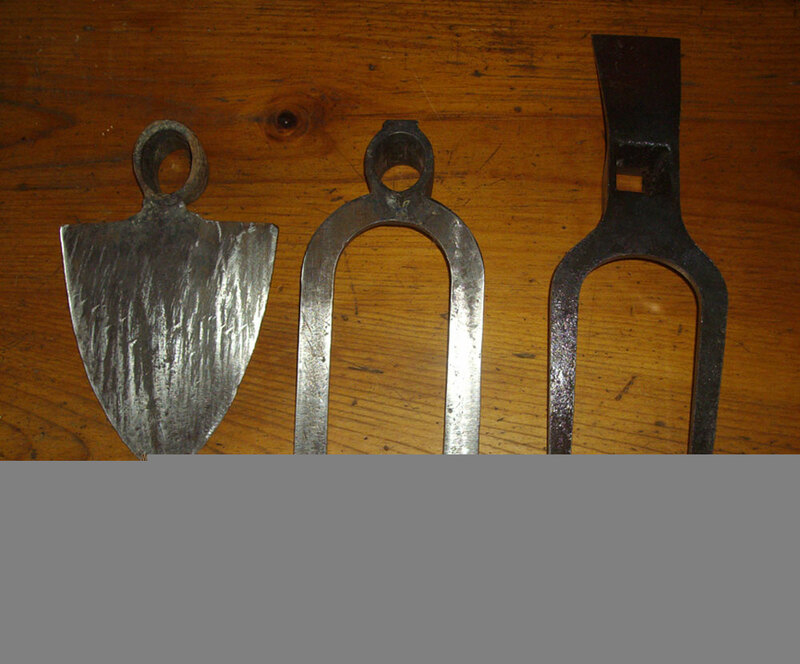 We compared three different designs – the pointed hoe we used last year, one with two 8″ /20cm long prongs and the heavier, longer-toothed Magna Grecia. The first two were quickly laid aside as incapable to compete with the third. A strong garden fork would be also have been fit for the job, but by then we had already learned that working in sod with rocky soil underneath some hoes were both faster and easier on the back. Last year we did it all with that pointed hoe (very left in the photo above). It accomplished the task, though our “new discovery” made the job this year notably easier. In addition, a considerably deeper loosening of the soil strata under each seed was possible – a decided plus, in our view. After the planting was mostly finished we distributed the relatively scant amount of the available mulch where it was most needed (i.e. directly over the holes). A portion of the potential garden space remained untouched, due to time constraints on that day. We fully intended to return soon, plant the rest of the tubers, dig up the 3, 5 and 0 and plant the grain. Rare for our maritime area at this time of year, we were experiencing an uncommonly hot spell. 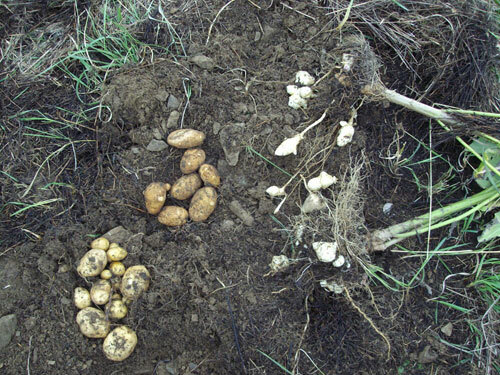 The soil was very dry when the potatoes were planted, and a few rainless days followed. We wondered if the seed would just wither before taking root, but “artificial” watering was not on the agenda of this “hard times gardening” experiment. Moreover, even what was on the agenda (some loving human attention -like hand picking the Colorado beetles and a little weeding) this garden did not receive, because the intended “soon” never came… However, “there is no great loss without some small gain”. Unsure how — after a whole summer of complete neglect — the garden would welcome us, we nearly abandoned it – at least for that season. It was Bill McKibben and his comrades’ global work party that inspired us to not give up. And so on 10/10/10 we walked up to that neglected spot with tools in hand and apology in our heart. The first impression: wilderness greater than in May. No sign that potatoes were ever planted here, or if so, where they may be hiding (because hard frosts – as we’d had by then – made the leftovers of their vines almost disappear). 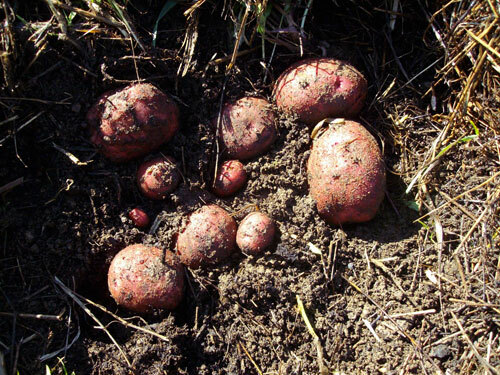 The potatoes were then retrieved, either with bare hands (from holes which happened to receive enough mulch initially to keep the resurrection of the sod somewhat in check) or by first carefully opening the hole with the hoe. 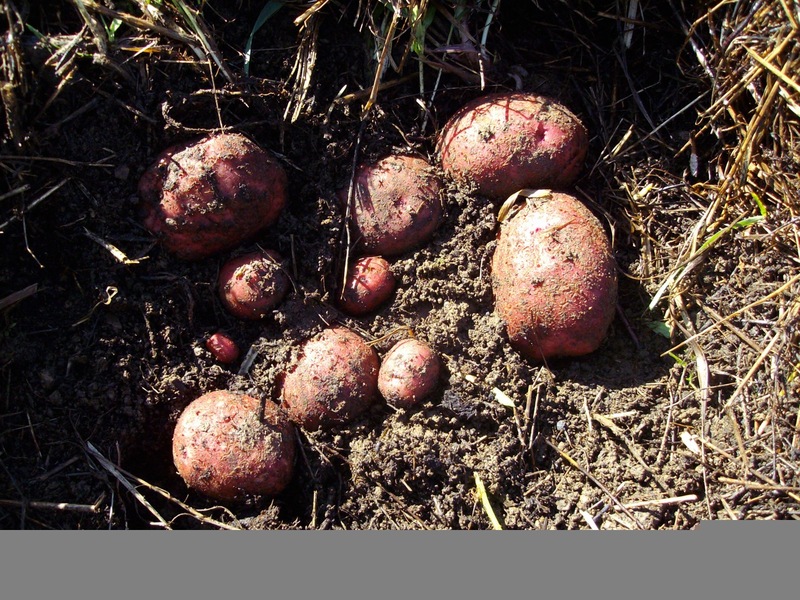 The sunchokes’ sturdy stems were initially pulled up -which yielded portion of the tubers – then the spot was loosened with the hoe and rest of them found. In the photo below the flowering sunchokes in the “3” are still standing and the “5” is only roughly dug. The “0” has been worked up to a fine seedbed, its inner oval planted in garlic. 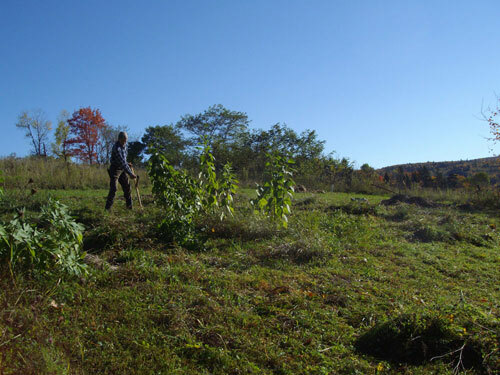 The outer edge — the repository for the sod (first shook of its soil) removed from what now is the garlic/onion strip – was subsequently heavily mulched with scythe-mown vegetation from the field adjacent to the garden area. 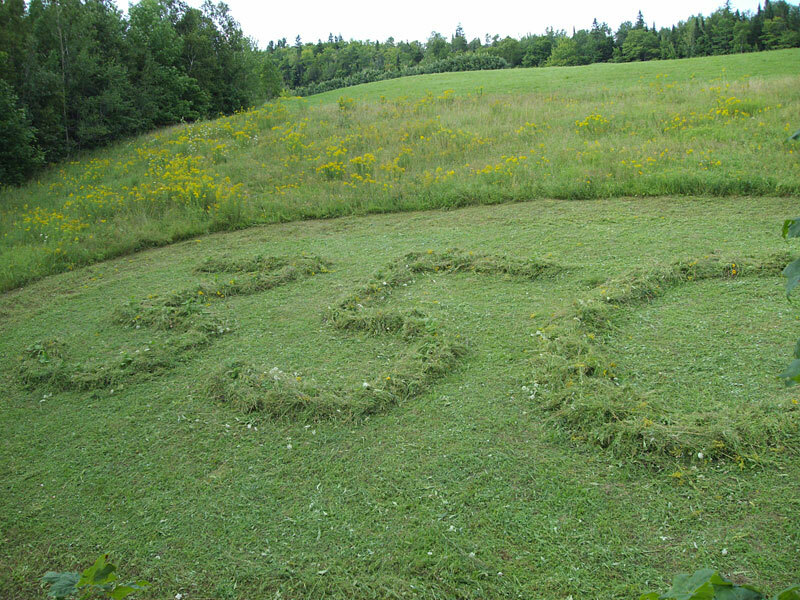 (This portion of what otherwise is a hayfield was saved (left uncut) as material to be used for periodic re-mulching of the garden throughout the summer. Had we managed to do so – a relatively small job – not only would this year’s crop benefit but the sod would present less of a challenge during the harvest’s as well as next spring’s digging. 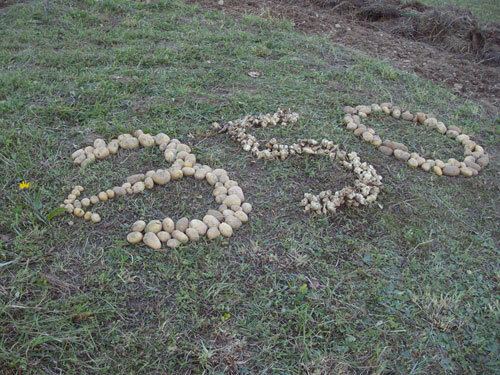 A portion of the crop of potatoes and sunchokes harvested from the “5” and “0” make up the 350 in the centre of the 0. What the title of this report implies by “further” was hardly an improvement over what we did with this garden the previous year. It turned out to be somewhat of an unintentional simulation of that stage of agriculture when a migrating band of hunter-gatherers would come by a place along their seasonal migration, poke holes in the ground with a digging stick, plant some seeds and move on, only to return in the fall to harvest whatever grew and matured without interim attention. Back then it was a smooth system. However, we are settled farmers whose lack of periodic care is not to be excused – and we urge gardeners NOT to follow our example in this respect. Due to the neglect during 2010 season we obviously “lost” the whole planned-for grain harvest, as well as, in all likelihood, a portion of the tuber yield. The “gain”, (after 36 years of learning!) 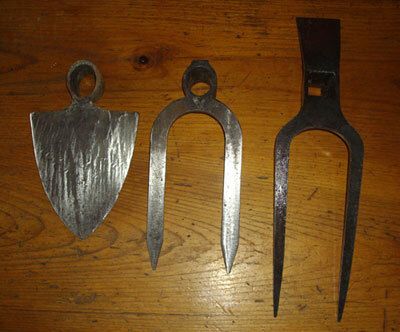 was seeing with just how little input, both in terms of tools and time, food can sometimes be grown.